Kotumb - Codeholic IT Services Pvt. Ltd.
Professional, Educational, Skill detail: User can add multiple professional, educational & skill details by easily selecting it from drop down or by doing custom entries. Kotumb admin roles & recruiter: In this we are helping user to create their profile. Once the profile is created by admin or recruiter they will send the details to user. Once the OTP details has been sent on the user registered phone number then the admin or recruiter will not have any authorities on the particular user profile. User profile created by admin or recruiter: User will logged in the details and now he/she can change their password. Also, if user is willing to change the username he/she can do it. Add user: Defined various admin roles & recruiter can create Kotumb user. User panel: It has options i.e. delete user, message to all users or you can select the user from the list and user can be searched easily according to their designation, name, city, pincode, address, skills. Manage new entries: The custom entries done by user in any category needs approval in admin panel for adding it successfully in drop down. Manage multi-language translation: Managing translation of app & website by using keywords. Manage advertisements: Visibility of advertisement is managed according to area (pincode). Manage user access zones: Various admin roles will get access for the particular zone (area) handling. Manage user roles permission: In this section admin can view & edit permissions granted to various roles. Manage roles of user: Admin can create multiple roles. KOTUMB is an Mobile Application & Website concept based on Professional Networking Platform. The Mobile Application was put into execution as seeing the growing demands of online platform. 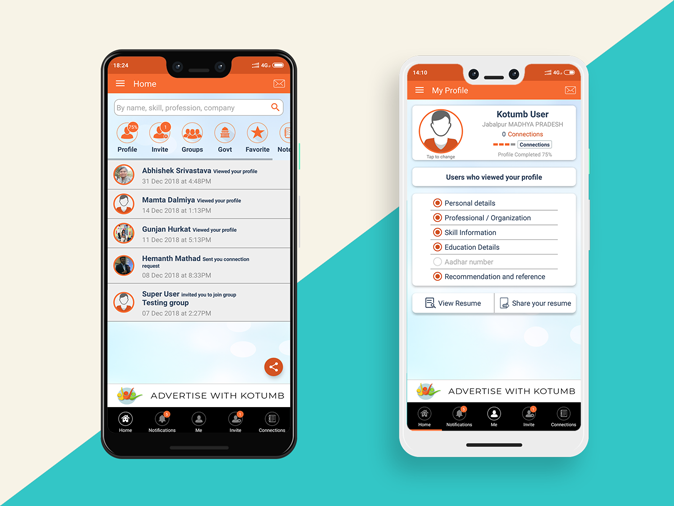 KOTUMB is a Multi-utility Professional Networking Platform where individual can write their professional information and invite others to join and form community. Organisations interested in providing job and other professional facilities can lookup for appropriate profile and get into business with the individuals. Signup: Any user can sign up directly by mobile app & website. OTP verification: Once the user signs up, there will be a One-Time-Password verification for authentication. Edit profile: Once a user profile is created, he/she can edit his/her profile accordingly. Notification: The user will be notified regularly for messages, new invites, recommendations, who viewed my profile. Notepad: The user will be notified regularly about their reminders. Favorite links: User can add & save his/her favorite links for viewing it later. Government links: User will get useful links such as job opportunities, exams details etc. Messaging: User can communicate with their added connections. Connection request: User can add and receive connection request to add up them in their list. View & Share resume: User can view & share their resume by messaging to the connections from their list or via mail to anyone. Personal details: User will fill their personal details after registering of account. Support system: By filling the details in the form user can raise the questions. You will get to see the pending & resolved issues accordingly in the sidebar. Search user: User can search other user profile and also can view it accordingly. Forgot password: User can set their password by verifying it with the OTP sent on their registered contact number. Who viewed my profile: User can check easily who else has viewed his/her profile. User will also notified. Multi-language: User can change their language according to suitability. Profile strength: User can analyze their profile strength on the basis of personal, professional, education, skill details.